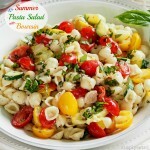 Summer Pasta Salad with Boursin is making another demand. Summer Pasta Salad with Boursin is begging to go on a picnic – again! I have been dealing with this demand ever since it first appeared in my kitchen. I placed fresh tomatoes, zucchini, summer squash, sauteed onion and fresh basil in a bowl. I introduced them to Boursin cheese and allowed them to mingle while I cleaned up a few things. 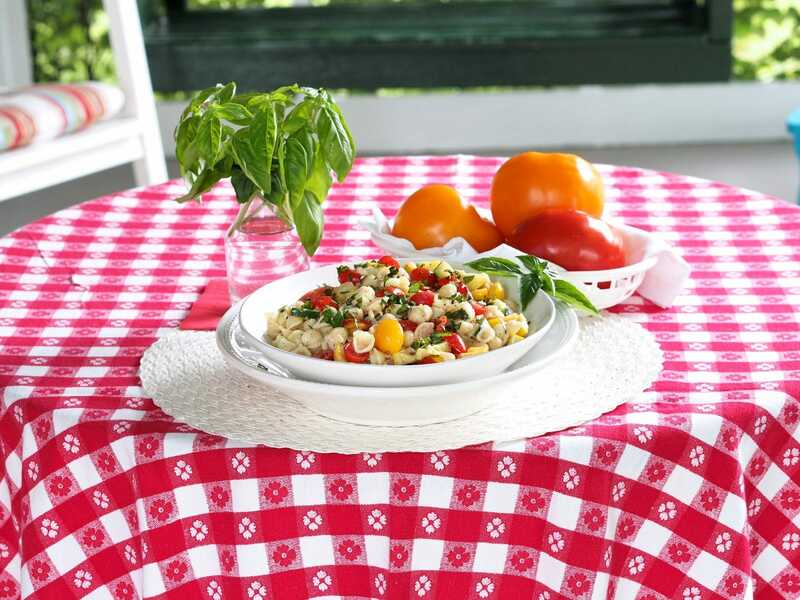 When I turned around, Summer Pasta Salad with Boursin was waiting with red-checkered tablecloth in-hand. I asked, “What’s up?” and its one-word demand was “PICNIC”! Its second word was “NOW”! We went on a picnic, I was afraid to say “no”. 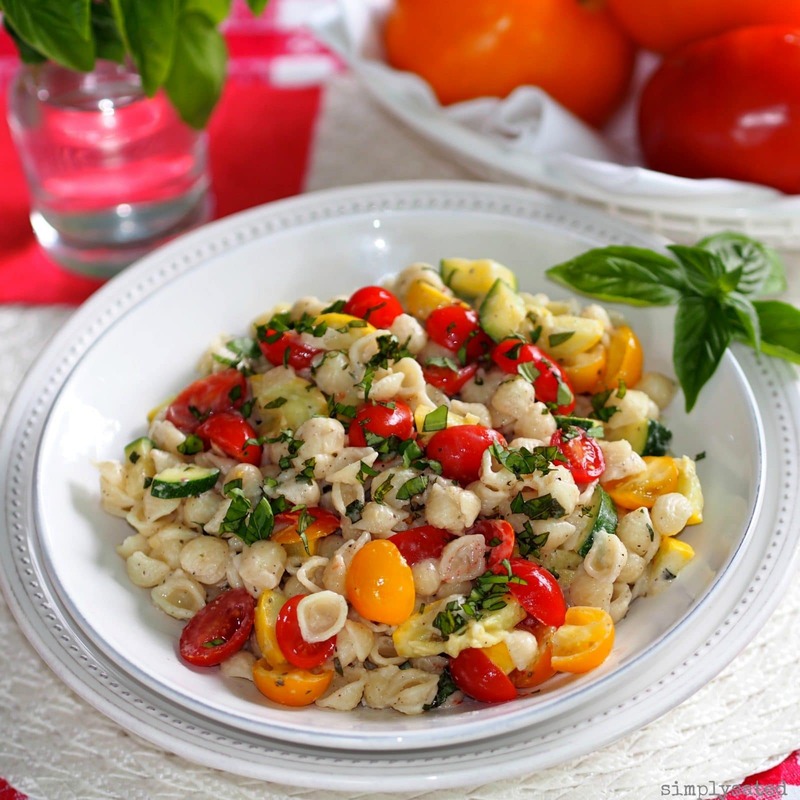 When I was preparing Summer Pasta Salad with Boursin, my husband walked through the kitchen. I was busy chopping zucchini and yellow summer squash when he asked what I was putting in the salad. I told him and he said, “I don’t like those things”. I responded, “You will change your mind when you taste this salad.” and that is exactly what happened. 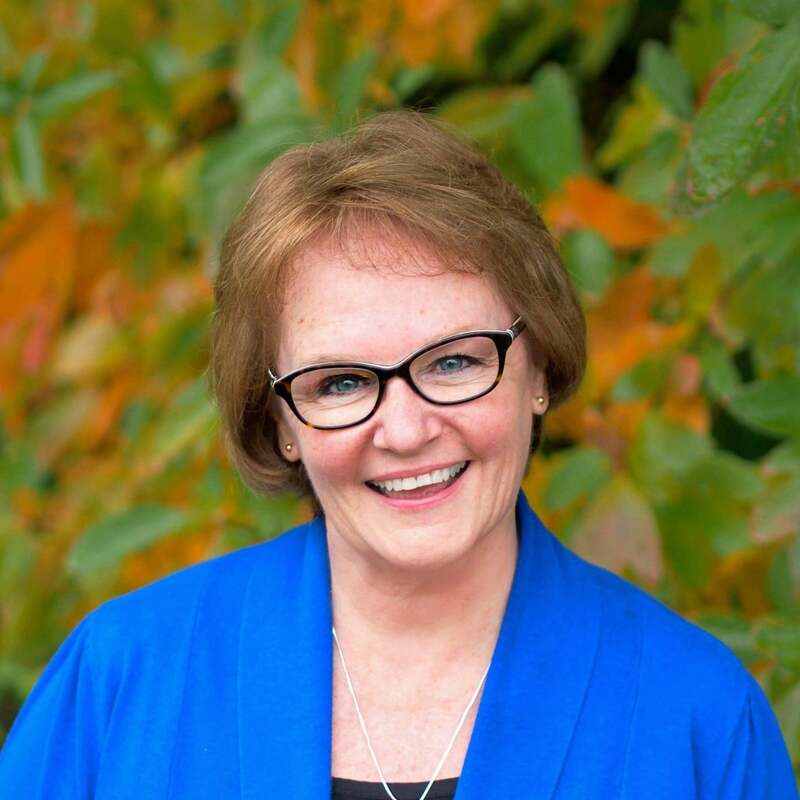 One of my favorite Julia Child quotes is “You don’t have to cook fancy or complicated masterpieces – just good food from fresh ingredients.” I love that! The use of fresh ingredients is what this salad is all about. I encourage you to make Summer Pasta Salad with Boursin – it is delicious, but I’m giving you fair warning. Like I stated at the beginning of this post, it loves to picnic. I finally wised up. Anytime this salad is in the house, I set the outdoor table with a red-checkered tablecloth, take it to the screened-in porch and fool it into thinking we are at the park. Thank goodness brains aren’t included in the ingredient list for this recipe. Using a large Dutch oven, bring 4 quarts water to a boil. Add macaroni and 2 teaspoon salt. Cook macaroni al dente according to package directions. Reserve 3/4 cup pasta cooking water and drain pasta. Using the same pot the pasta was in, heat oil and butter until until shimmering. Add onion and cook 3 minutes or until softened. Add garlic, turn down the heat and cook 1 more minute. Garlic burns quickly so stir often and watch closely. Add yellow squash, zucchini, 1/4 cup of reserved pasta water to the onions and garlic. Cook until vegetables are tender but not mushy, about 6 minutes. Serve immediately or refrigerate covered until ready to serve. This salad is great served hot or cold. Add cubed chicken and serve as an entree. 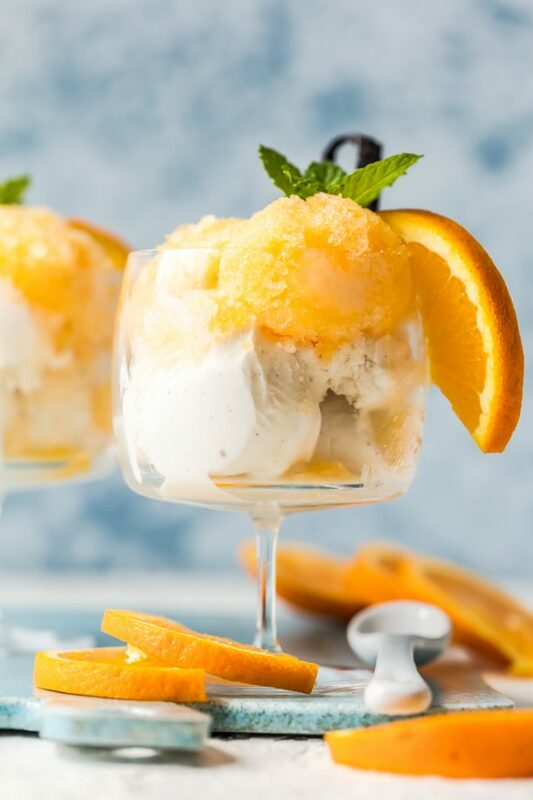 This recipe is looks great. Summer vegetables are great in salads and we eat a lot of salads in the summer. Thanks, Linda. 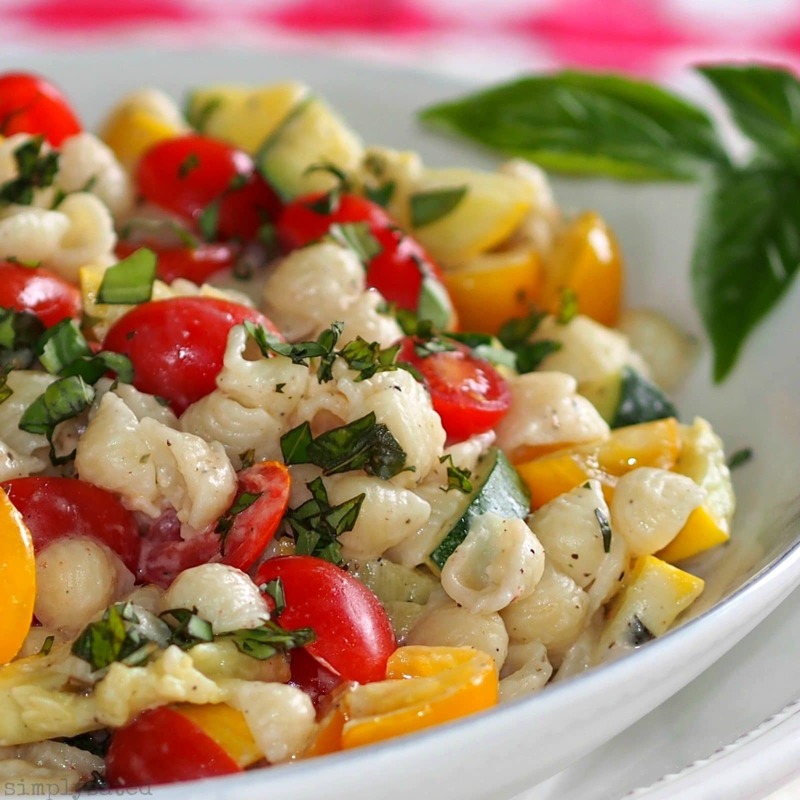 You will love this salad and it will be perfect for eating at the lake. Hope you love it. Do you melt the boursin cheese?